This time 'the Bank of the Swiss Banks' will just not do fine. Not putting hedges on its foreign exchange exposure is an invitation for Crime. Rank-and-file incompetence in St. Gal-Land or a more sinister plot elaborated by the club have to not be ruled out. The United States unlike other countries doesn’t set a currency target. The U.S Treasury says this is our currency; you deal with its problems. 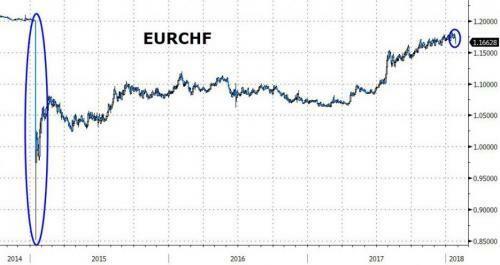 The problem for the Switzerland National Bank(SNB) is that when you change the complexion at the U.S federal reserve ("inflation not a big deal "aka The Mnuchin moment' in Davos Switzerland) what you get is a much weaker dollar. The U.S exports its inflation to European countries (one of its characteristic manifestation is through the increase in the European real interest rates) and while ECB is pulling back from quantitative easing, Europe is being left with zero reactivite capacity or real economic output capacity to absorb. The next consequence for the SNB is a Swiss Franc surging against the dollar and euro. Yes, it appears that money will flow again into 'St.Gallen-Land" and will make the SNB Foreign Assets look 'worse' probably more than they truly are but here is the predicament of Prof. Thomas Jordan : the SNB, also dubbed as the world's largest hedge fund, to swing back at a loss. We are all conjecturing here, and not saying the 'SNB must trade'- they must rather operate at the least frictional cost because why would the Swiss absolutely want to pay CHF25-100B in-kind foreign aid to the foreign countries and hedge funds? Simply last year the SNB earned 32 times more than the 85 Swiss private banks (Pictet, Mirabaud, Lombard, UBP, J. Safra) for twice less assets. Since 2015 The Swiss National Bank (SNB) have indeed been charging a 0.75% fee on large deposits at a core policy aimed at weakening the Swiss franc and boost the velocity of money. The 0.75 percent negative interest on large deposit comprised only 3 to 4 percent of the earnings. What the SNB in fact did to weaken the Swiss franc was buying up foreign assets- They even own roughly $90 billion of US companies. Under these circumstances and as a consequence of the franc’s 8.5 percent drop against the euro last year, the Bank of the Swiss Banks has printed a $55B profit for $836B of assets on its balance sheet for year 2017..
With an enviable position of +$55 billion in the coffers, beating the Swiss Private banks 31-to-1, with an enormous position on foreign assets and amidst the extreme macro conditions in the Eurozone- How come the SNB does not hedge its currency risk against a Swiss franc appreciation on $836 of assets? In the pre-electoral period it would be regrettable that the SNB 'swings' at a loss, indeed because of a large, but failed, experimentation made by two professors who do not comprehend their exposure, blinded by the glare of the monetary policy textbook and completely obnubilated by their money printer and its magic power. I would view a lost at the Swiss National Bank (SNB) as an in-kind subsidy to the foreign countries and hedge funds.